Hillsboro’s Ethan Watson rises above a host of St. Patrick (Ky.) defenders on Saturday night at Hillsboro High School where the Indians and the Saints battled as part of the Ohio Valley Hoops Classic. The Hillsboro Indians moved to 1-1 on the season Saturday night when they beat the Maysville (Ky.) St. Patrick Saints 89-51 in their second matchup of the Ohio Valley Hoops Classic held at Hillsboro High School. The OVHC was a showcase of some of the top talent from around the region Friday, November 30, and Saturday, December 1, at Hillsboro High School and it was obvious from the start of this game that the Saints were oddly out of place at the event and they were overmatched against Hillsboro from the opening tip on Saturday. 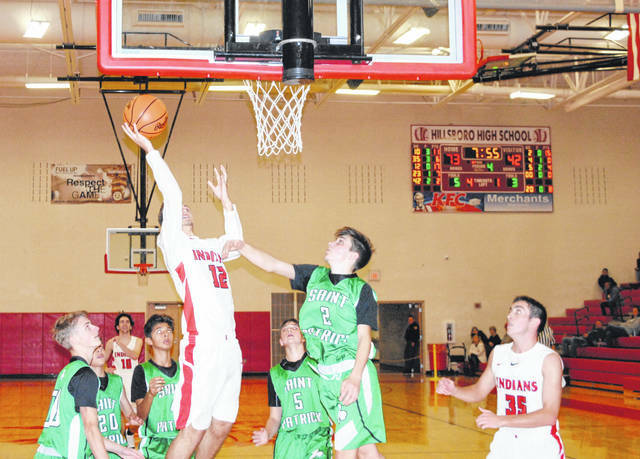 The Indians jumped out to a 15-7 lead behind a strong start from Luke Magulac who had five points in the initial spurt by Hillsboro and finished with 11 in the game. The Saints tried to stem the flow with a timeout but it had little effect on the Indians as sophomore Ryan Scott and senior Ethan Watson combined to score the final 12 points of the first quarter for Hillsboro including eight by Watson who had 11 of his team leading 19 points in the first quarter and rattled home three triples. It was more of the same in the second quarter when Hillsboro stretched its lead to 22 points at halftime with the scoreboard reading 45-23. The Saints let it all hang out in the third quarter as the poured in 19 points and made six three point buckets in the frame but, it was not enough to rattle the Indians who put up 28 in the quarter to secure a 73-42 lead heading into the fourth. Hillsboro emptied their bench in the fourth and still netted 16 points in the final quarter while limiting the Saints to just nine as the secured the 89-51 win.